Yet another article about DTM… I guess by now I can’t even get away with calling it a “mini series” anymore, can I?! Today, I want to share a tip that came in handy a couple of weeks ago while troubleshooting a relatively complex implementation with a lot of rules. The topic: I know that I am setting a “variable” or event somewhere — say event2. How can I find out which rule is doing that? There are actually two ways, and I shall describe them both. 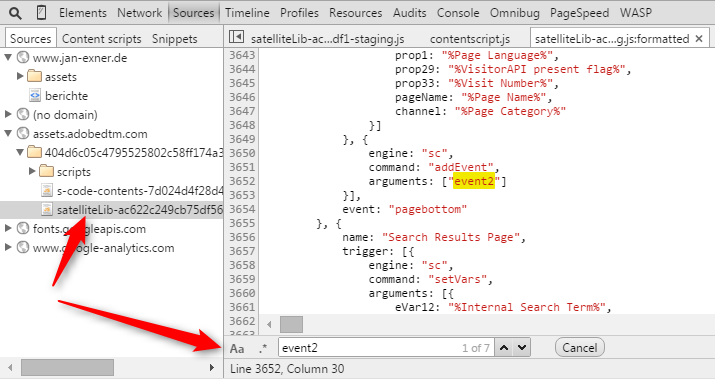 The easiest way to find where you’re setting a “variable” or event is to use the browser’s built-in tools. Let me show you how to do it with Chrome. Beautify the code (see tip #4 in David Vallejo’s article on debugging your GTM). Now you can use CTRL-F to search for the “variable” or event you’re looking for. From there, just scroll up very slightly, until you find the name of the rule. That was almost too easy, wasn’t it? Remember that you can see all the rules in the Console? If we can see them, then we can iterate through them, right? And what does it do? Ugly, but with a huge collection of rules, this might just be useful. 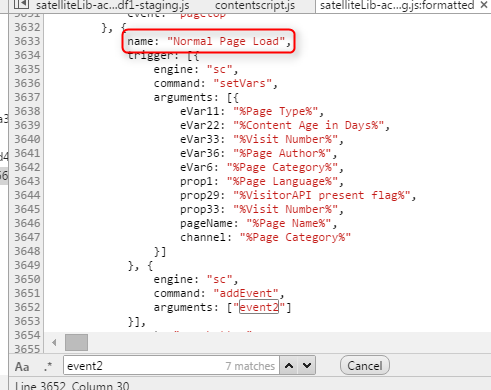 The snippet works for Event-based and Direct Call Rules, but it has to be modified a little bit for Page Load Rules. This is great stuff, thanks for sharing Jan! Nice touch, Eric, thanks a lot!